Bosworths Landscaping – You Dream it, We Design it, build it and maintain it! You Dream It - We Design It, Build It and Maintain It! 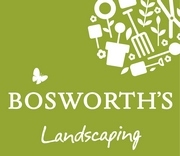 Bosworth’s Landscaping is the landscaping division of the Bosworth’s Garden Company based in Burton Latimer, Kettering, a family run business established in 1959. We are award-winning member of the Association of Professional Landscapers and specialise in garden design, hard and soft landscaping and maintenance for both domestic and commercial clients. Our work is carried out by in-house teams of experienced staff and qualified designers to ensure you receive top quality professional service and workmanship. We cater for all size projects from single projects such as a small paved seating area to a complete garden makeover with ongoing maintenance. Based at our garden centre in Burton Latimer we service all surrounding counties of Northamptonshire, Bedfordshire, Leicestershire, Rutland, Cambridgeshire and Peterborough. Your Dream It - We design it, build it and maintain it. Just to say Thank you for our lovely path both delighted and how hard the young men worked so quickly and tidily. Very much appreciated. Thank you again. One massive thank you for all your hard work over the last 5 weeks. You have transformed our garden, a garden we can now sit in and not slave in.